I may have spoken too soon. 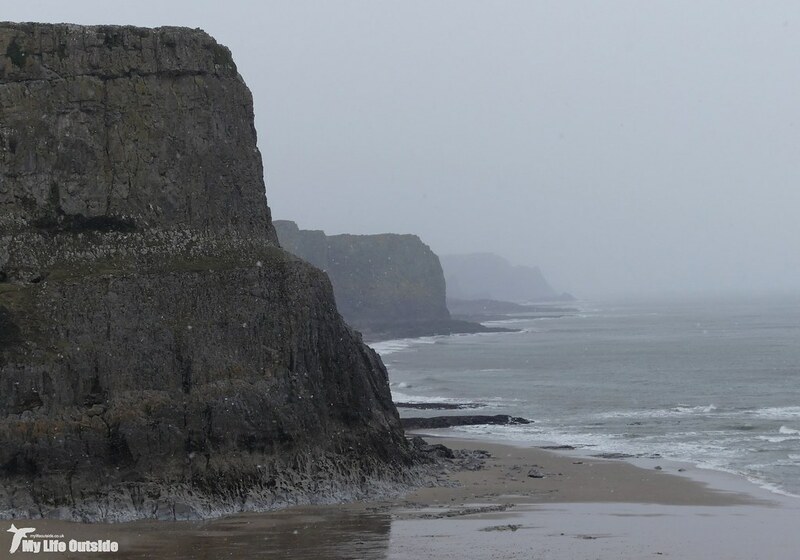 Just a few days after celebrating the arrival of our first spring migrants and heralding the end of winter proper it seems that mother nature has had other ideas. The first warning signs came yesterday which, following a comparatively balmy evening on Friday, dawned bitterly cold. 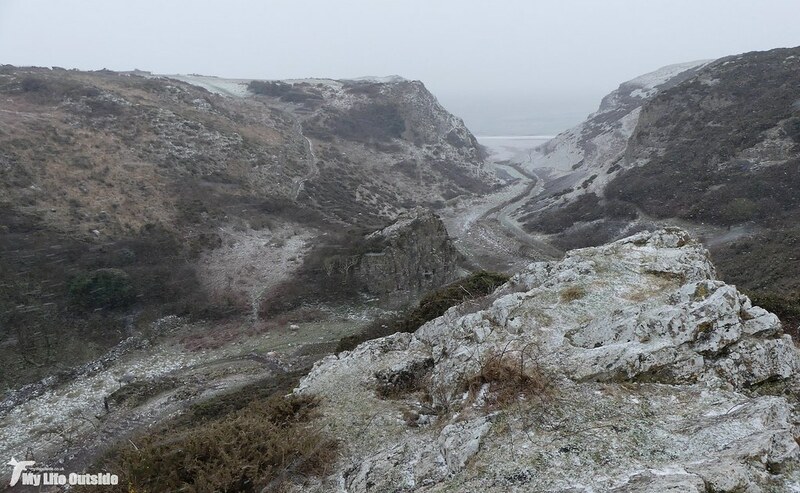 We still managed to walk a couple of local hills but the wind was absolutely freezing and as the hours passed began to be accompanied by the occasional flurry of snow. 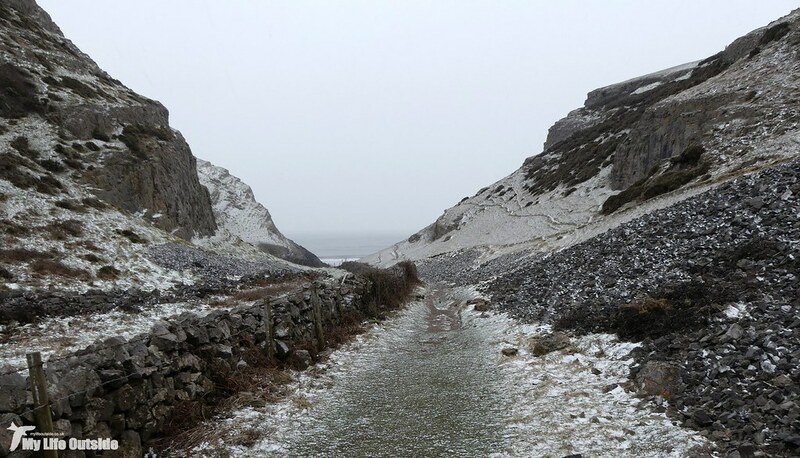 Those flurries only increased as darkness fell leaving us wondering as to what to expect come Sunday or if, as before, Swansea would somehow avoid the worst from this latest easterly onslaught. And did we? Sadly yes but this time there was at least a light dusting even if it looked as if it wouldn't last the morning. 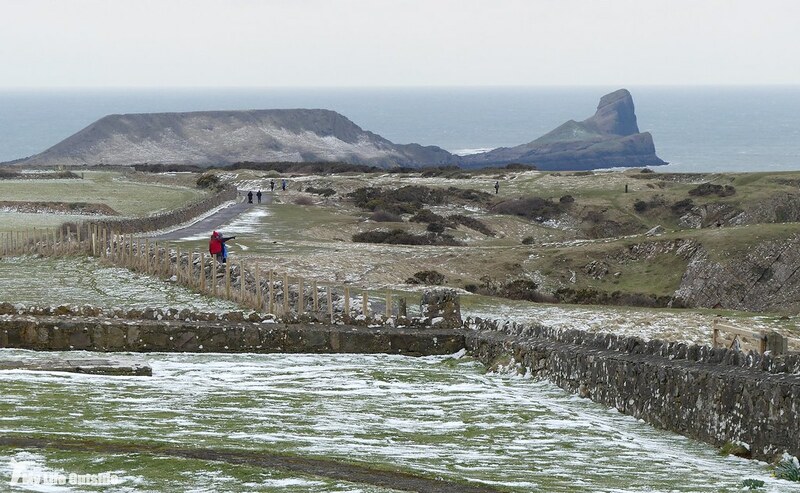 That didn't stop me lusting after the pristine white vistas filling my social media feeds however which somehow included Rhossili. 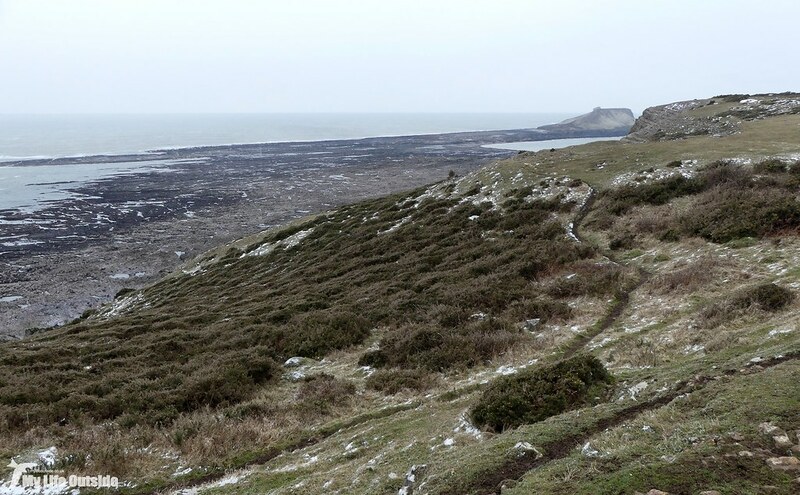 Quite how or why this small area of Gower had managed to catch more snow than its surroundings I have no idea but now that it had we were certainly going to make the most of things. 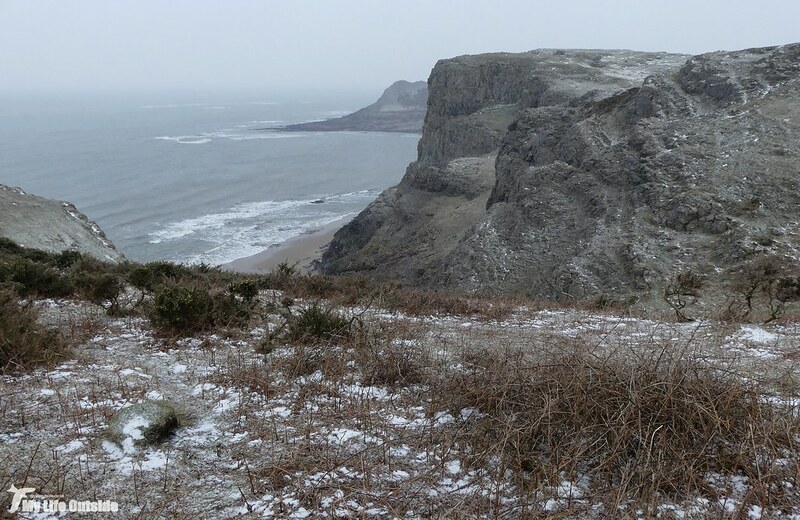 So it was that we found ourselves down on Gower by midday, gazing out on a distinctly chilly Worm's Head. And by chilly I do mean absolutely baltic. The wind was blasting in from our rear freezing fingers in seconds and, on the unfortunate instances when it was necessary to face this onslaught head on, proved physically painful for any exposed skin. Needless to say I was glad to have layered up before heading out and it probably won't surprise you to hear that wildlife was relatively thin on the ground. A few Meadow Pipits and Stonechats here and there but that was about it. 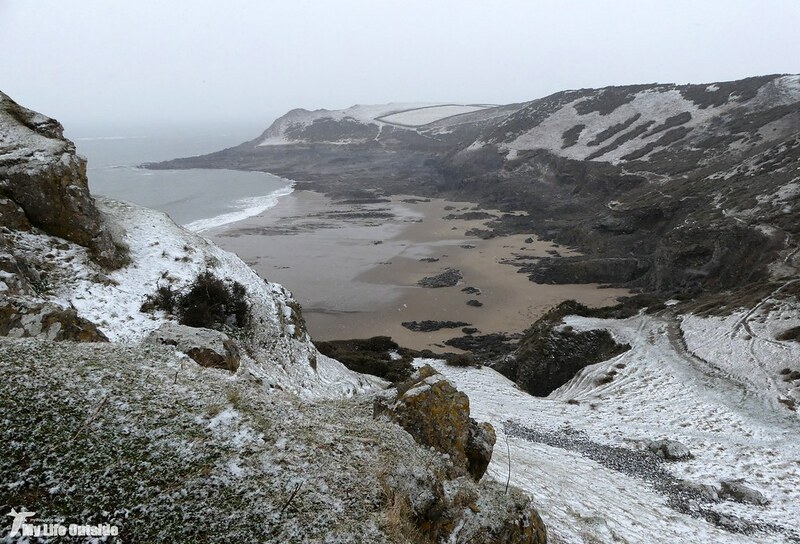 Conditions took a distinct turn for the worse as we reached Fall Bay, our view out along the Gower coast obscured by incoming weather. I expected nothing more than a light snow shower but what actually arrived were sustained blizzard conditions involving near horizontal snow which somehow managed to find even the smallest of gaps in our clothing. Should we perhaps take the sensible approach and turn back where warmth and comfort awaited? Not a bit of it. Instead we pushed on towards Mewslade and were rewarded not only with some fairly unique views of this oft-photographed landscape but also what in the end turned out to be a very enjoyable walk. Fellow ramblers were non-existent meaning we had the place to ourselves with only four Chough and the occasional Raven for company. Mewslade itself was almost unrecognisable from the sun soaked valley I normally think of and I had hoped that it might hold a couple of sheltering migrants. Sadly the closest we got on that score was a silent Chiffchaff (possibly new in but just as likely an overwintering bird) as well as a couple of Redwing who surely can't be long for these shores. Everything else had presumably moved inland which, let's face it, was the far more sensible option. All the while the landscape around us was whitening before our eyes and it was clear that not everything was having as much fun as we were. Lambs, many born in the last day or so, looked particularly vulnerable as they tried to shelter beside their mother's who themselves looked less than happy. 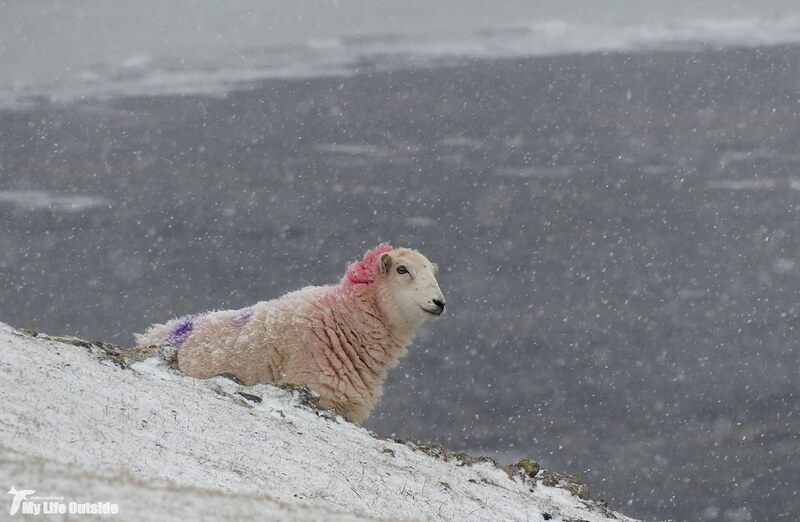 That thin line between survival and death on day's such as this was exhibited no more clearly than by the sad sight of a recently deceased ewe, lost whilst giving birth. 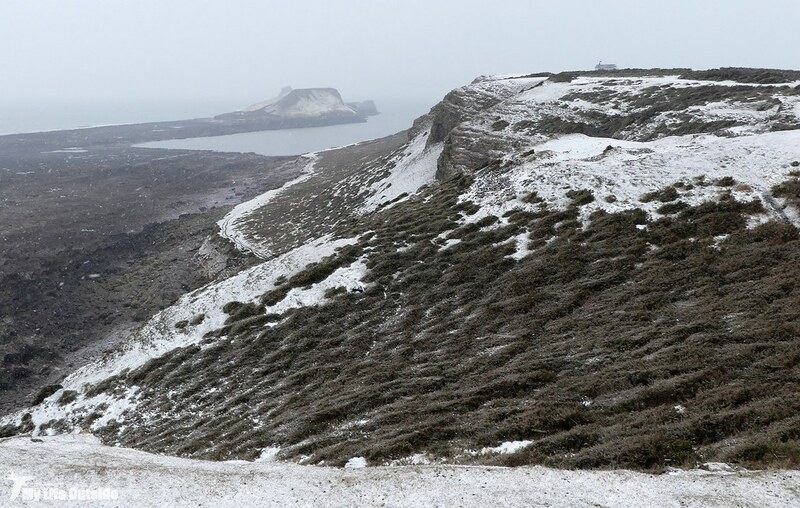 By the time we'd made it back to Rhossili our surroundings were white over but thankfully the wind had abated making conditions a tad more tolerable. Over on the Vile a flock of around sixty Golden Plover were looking restless whilst down on the beach thousands upon thousands of Gulls gathered to feed. Linnets and Goldfinch roamed nearby but as for the hoped for spring migrants? We may have to wait a little while longer.